Algorithms have a growing place in medicine. There are at least two kinds of algorithms – practice guidelines and predictive. Practice guideline or best practice algorithms may emerge out of practice-based research or consensus panels which recommend specific practices to improve care. One example relates to algorithms in intensive care. Cleveland Clinic has excellent examples on their medical education website which include everything from weaning to acid-based disorders. Some may criticize this as “cookbook medicine.” But with the complexity of care, especially intensive care, these kind of algorithms should be welcome. How these can be integrated into clinical decision support in electronic medical records is yet to be fully realized. Algorithms can potentially provide real value in medical practice and to patient decision making as well. They are part of a movement toward artificial intelligence in health care. My post on HealthWorksCollective last week. I am sure there are many more apps being built in the EU but wanted to call attention to a few I am familiar with. Health and medical apps are growing at an incredible pace in the US. But what about Europe? Are there equally creative ideas going on across the pond? Fortunately, there are plenty of examples. One hot spot is Nijmegen, Netherlands at the Radboud Reshape and Innovation Centerat UMC St. Radboud University Medical Center. Under the leadership of Lucien Engelen, the center has already produced 4 apps. First is AEDS4.US which enables the user to find the nearest defibrillator devices at a moment’s notice using this iPhone/Android app which integrates maps and location services. It has over 50,000 downloads but is still most heavily used in the Netherlands. Anyone with a smartphone can add AEDs to the app. Second is AYA4 – community for young cancer patients. Third is aniPad app to enable communication between patients, families and the healthcare team. Fourth is Hospital Visitor Planning to coordinate visitors coming the hospital. The newest app is REshape HealthTalk which enables translation during healthcare visits for non-native speakers. The ReShape Center also sponsorsTEDxMaastricht which will take place April 2, 2012. In Belgium, there is a growing number of startups and a startup incubator specifically for health. HealthStartUp“organises events in Europe that bring together entrepreneurs, healthcare professionals, policy makers and investors.” Like many of us, HealthStartUp seeks to empower patients and improve the quality, efficiency and accessibility of healthcare. Check out their interview with miMedication which not only describes their product but also discusses being an entrepreneur. miMedication is a niche PHR product in English developed by Mitchell Silva, who is an epatient in his own right. From Spain, there is a new app called Doctoralia, a service to find, rate and contact medical services in 14 countries. In addition to the website search by country there is an iPhone app in the App Store. The combination of international search, rating and actual scheduling information makes the service unique. Also from Spain we have Medical Exchange Medting which includes collaboration platforms and medical viewers. It is a comprehensive tool set which enables elearning, social networking for physicians and medical students. The Medting Media Manager enables the management of medical images including DICOM and pathology standards. Medviewer is a lightweight version of the image viewer which can be imbedded into websites and web applications for continuing medical education, etc. The products can be used for free and the primary business model is licensing for enterprise use for which they also provide customization and services. While not yet a mobile app, it will display on the iPad. From Hungary there is Webicina founded by Bertalan Mesko, MD, is a curated social media resource tool in multiple languages. The solution has two paths: one for the medical professional which is cataloged by medical specialties from anesthesia to transplantation. The path for the “Empowered Patient” goes to specific diagnoses from pregnancy to psoriasis.This is also available as an mobile app in the iPhone Store and Android version. Webicina also has a tool called PeRSSonalized Medicine with an emphasis on curated RSS feeds for medical resources including major medical journals, blog and news. It enables the busy health professional to scan multiple articles for relevance to their practice at a glace and drill down on topics of interest. Again, this too is in multiple languages and curated by real people, not algorithms. Dr. Mesko who goes by @Berci on Twitter is a popular speaker internationally and continues his medical research while maintaining this service. Webicina has recently partnered with Basil Strategies of Paris, France and sponsor of the Doctors 2.0 Conference there. There are a growing number of annual conferences on Web 2.0 in healthcare in Europe. TEDxMaastricht in the Netherlands in April is in the true TED tradition with fast paced presentations but a focus on innovation in health care. The program includes speakers from throughout Europe but also the US. The program includes patients and their dynamic stories of survival as well medical professionals focused on patient-centered care. Doctors 2.0 and You in Paris in May billed as “an international healthcare social media and web 2.0 conference,” is sponsored by Basil Strategies which is now in partnership with Webicina. The conference has a strong emphasis on mobile apps as well as social media and patient and professional communities. A contest for startups rounds out the program. Check out the videos from last year. Salud 2.0 meets in Bilbao, Spain in July. It includes international and Spanish presenters on topics from Health 2.0 administration and clinical practice. Last year’s presentations are online throughSlideShare. Preliminary information on this year’s program is available. Last year was also the first Health 2.0 Europe in Berlin sponsored by the US Health 2.0 conference group of Matthew Holt and Indu Subaiya. It included their usual format of individual speakers on the latest apps and interviews with entrepreneurs and quick paced demos. Bottom line, Europe is alive with activity – building apps, experimenting with social media in healthcare and a growing number of conferences to show it off. This small sampling should give you a taste of some exciting developments worth keeping tabs on. This line up is complemented by an large, expert faculty including some friends: Lucien Engelen and Roni Zeiger. Daniel Kraft organizes this unique event every year. Listen to his interview from last year. Daniel Kraft from The Doctor’s Channel on Vimeo. I recently read two books on EHR/EMRs: one was published in 2007 but still has relevance, the other published in 2010 and focused on implementation. Electronic Health Records: A Guide for Clinicians and Administrators by Jerome Carter is published by the American College of Physicians is a 500+ page volume written primarily for physicians. The first part of the book is a comprehensive review of EHRs including infrastructure, perspectives on the the use of EHRs for things like outcomes, clinical decision support and quality improvement and legal and privacy issues. The second half of the book is devoted selection and implementation of EHRs with a comprehensive workbook on product features and vendor selection. 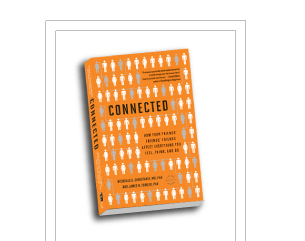 The majority of the book is still highly relevant with the only exception being some of the information on infrastructure which seems outdated and the lack of discussion of mobile uses of EHRs which is definitely a future goal. 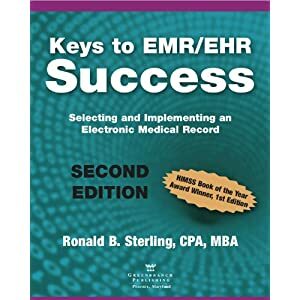 The second book, Keys to EMR/EHR Success: Selecting and Implementing an Electronic Medical Record is also in its second edition. This work by Ronald Sterling begins by walking the reader through the initial questions of why invest in an EMR and how to transition from a practice management system to a full-functioning EMR and how to evaluated the potential legal risks, all common issues for medical practices considering this transition. The author then moves on to product selection and making a decision and negotiating a contract. These implementation details can easily be lost in the selection process and this kind of systematic approach is essential. Finally, the book addresses implementation, activation and support. Again, ongoing support is a common issue for those from the health IT world but not always considered by physicians or practice managers. Both books provide helpful advice and background for EMR implementation. For those considering an EMR or who want to become familiar with one, these are helpful resources. The book from ACP could also be considered as a textbook in a health informatics curriculum.